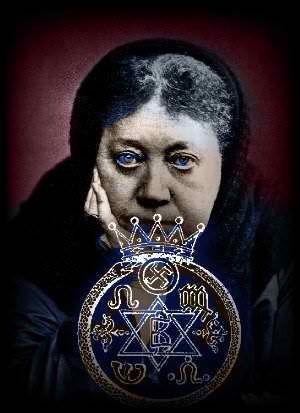 It is CRITICAL to understand that Freemasonry is a religion whose only stated enemy is the original Catholic Church. When you realize how connected the political establishment is via Freemasonry, it becomes extremely illogical not to convert to the original Catholic Faith. 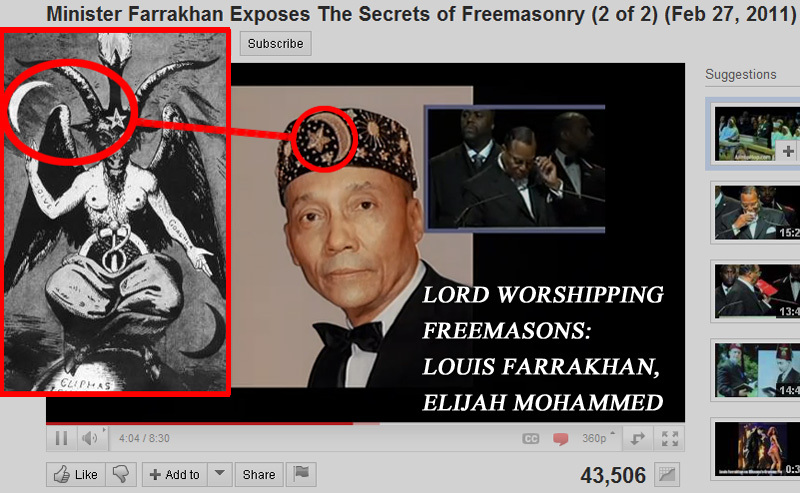 Lucifer is very real, worshipped by 10 million or more persons in high positions in the world today. Since these world leaders, bankers, etc. are so hell-bent on destroying the Catholic Faith, wiping it off the planet, isn't it a good idea for everyone to double-up our efforts and try to preserve it? Below is an unorganized surplus of random quotes regarding banking, subversion, propaganda and Freemasonry, in no particular order. "The last secret ends with an Ekphonesis (Per omnia saecula saeculorum). This is only a warning of what is coming. When prayers began to be said silently, it still remained necessary to mark their ending, so that people might know what is going on...In the Roman Mass there are three cases of it-always the words: "Per omnia saecula saeclorum", to which the choir answers "Amen"...The choir sings and the celebrant says the Sanctus. Then follows the Canon...The Lord's Prayer follows, introduced by a little clause..."
“We are grateful to The Washington Post, The New York Times, Time Magazine and other great publications whose directors have attended our meetings and respected their promises of discretion for almost forty years. It would have been impossible for us to develop our plan for the world if we had been subject to the bright lights of publicity during those years. But, the work is now much more sophisticated and prepared to march towards a world government. The supranational sovereignty of an intellectual elite and world bankers is surely preferable to the national autodetermination practiced in past centuries.” - Luciferian Freemason David Rockefeller, founder of the Trilateral Commission, in an address to a meeting of The Trilateral Commission, in June, 1991. “Fifty men have run America, and that's a high figure.” - Joseph Kennedy, father of JFK, in the July 26th, l936 issue of The New York Times. “The Trilateral Commission is intended to be the vehicle for multinational consolidation of the commercial and banking interests by seizing control of the political government of the United States. The Trilateral Commission represents a skillful, coordinated effort to seize control and consolidate the four centers of power political, monetary, intellectual and ecclesiastical. What the Trilateral Commission intends is to create a worldwide economic power superior to the political governments of the nation states involved. As managers and creators of the system ,they will rule the future.” - U.S. Senator and Luciferian Freemason Barry Goldwater in his l964 book: With No Apologies. The U.S. does not have a two-party system of government. This is the Masonic Party's system of government and they are having quite a party. 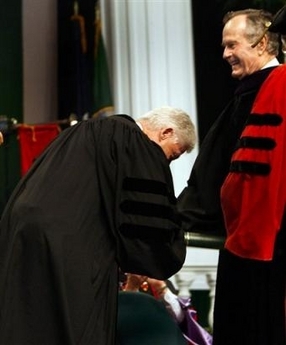 (pictured left) U.S. President Bill Clinton (Democrat, 42nd U.S. Pres.) bows down to his Masonic Lodge Master, previous and Luciferian Freemason U.S. President George H.W. Bush (Republican, 41st U.S. Pres.). 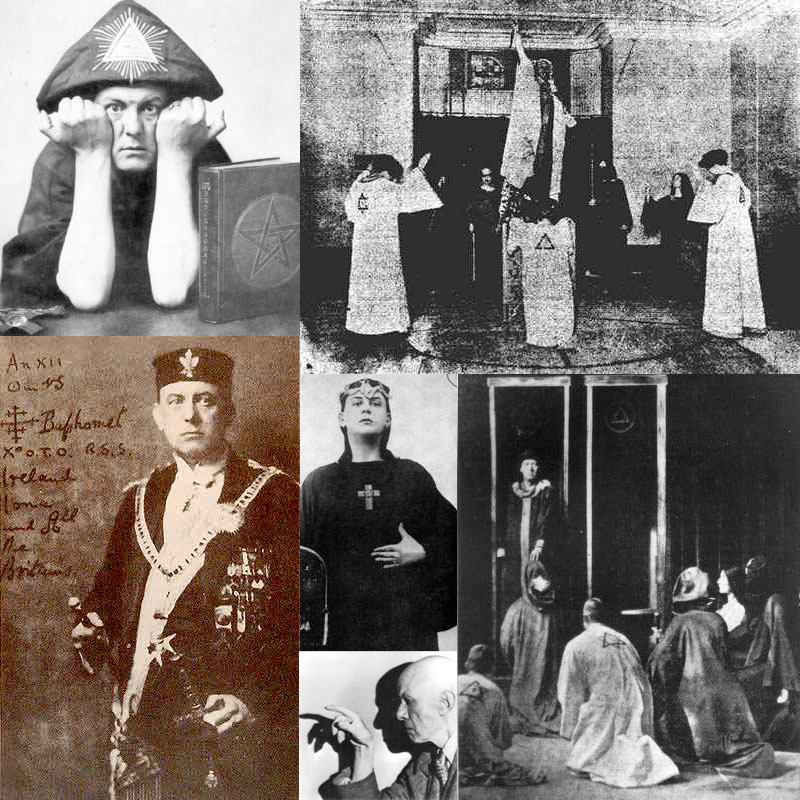 Famous Satanist Aleister Crowley: The Book of the Law Told by his spirit guide "Horus" that the Great Work of the Illuminati, the transformation of mankind, would essentially be accomplished by the decade of the 1990s. Allister Crowley, Luciferian Freemason of the U.S. Grand Lodge, Ordo Templi Orientis. 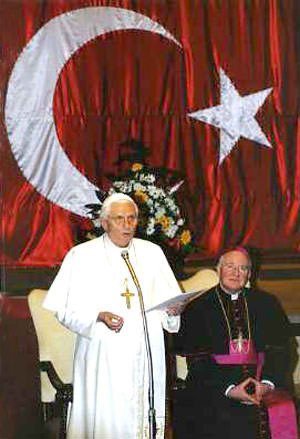 Notice the Novus Ordo pyramid and the Star of David symbols in their rituals. Future President George H.W. 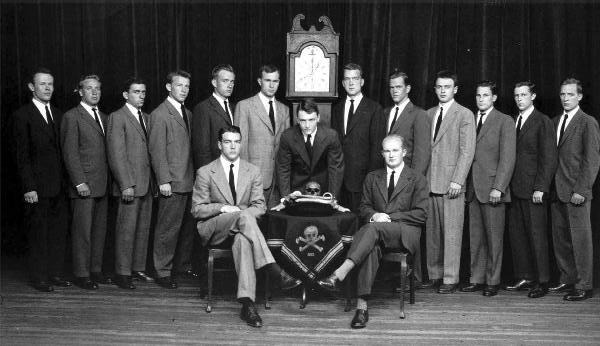 Bush (41) in this Yale Skull & Bones photograph. He is standing on the left side of the clock. In 2003, Tim Russert, a naive Vatican II Catholic, asks too many questions about Skull & Bones to 2004 Presidential Candidates John Kerry - D and George W. Bush - R. Once again, there is no Democrat or Republican Party. There is only the Masonic Party. All we have is the illusion of a choice. Vatican II Catholic Tim Russert (May 7, 1950 - June 13, 2008) dies young of a “heart attack.” Did he ask too many questions? We'll never know for sure. “The powers of financial capitalism had another far reaching aim, nothing less than to create a world system of financial control in private hands able to dominate the political system of each country and the economy of the world as a whole. 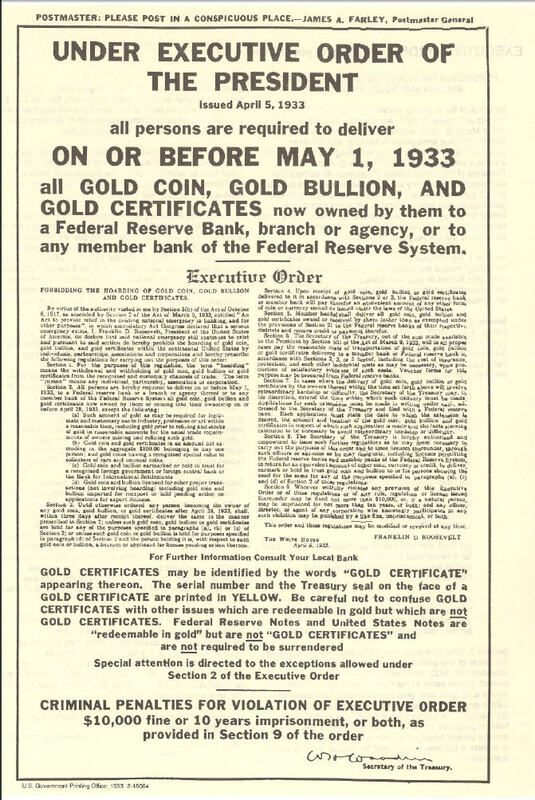 This system was to be controlled in a feudalist fashion by the central banks of the world acting in concert, by secret agreements, arrived at in frequent private meetings and conferences. The apex of the system was the Bank for International Settlements in Basle, Switzerland, a private bank owned and controlled by the worlds' central banks which were themselves private corporations. The growth of financial capitalism made possible a centralization of world economic control and use of this power for the direct benefit of financiers and the indirect injury of all other economic groups.” - Tragedy and Hope: A History of The World in Our Time (Macmillan Company, 1966,) Professor Carroll Quigley of Georgetown University, highly esteemed by his former student, William Jefferson Blythe Clinton. “From the days of Sparticus, Wieskhopf, Karl Marx, Trotsky, Rosa Luxemberg, and Emma Goldman, this world conspiracy has been steadily growing. This conspiracy played a definite recognizable role in the tragedy of the French revolution. It has been the mainspring of every subversive movement during the 19th century. And now at last this band of extraordinary personalities from the underworld of the great cities of Europe and America have gripped the Russian people by the hair of their head and have become the undisputed masters of that enormous empire.” - Winston Churchill, stated to the London Press, in l922. 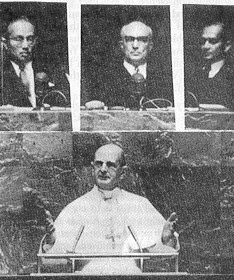 Montini (a.k.a Anti-Pope Paul VI): a key “architect” and the non-authority bearing “promulgator” of the Apostate Vatican II Council pictured giving a speech on October 4, 1965 at the Masonic United Nations. Montini in his address to the United Nations, called that godless monstrosity [The UN] “the last, best hope of mankind...” not surprisingly he received a standing ovation from the Wilsonian Democracy Pushers/Atheistic Communist packed house. “What is at stake is more than one small country. It is a BIG IDEA. A NEW WORLD ORDER where diverse nations are drawn together in common bond to achieve universal aspirations of mankind: Peace, and security, freedom and the rule of (Judeo-Masonic Mosaic) law. 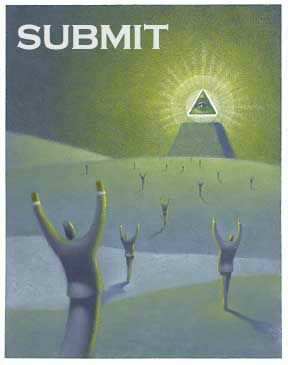 Out of these troubled times, our 5th objective, a NEW WORLD ORDER CAN EMERGE. Now we can see a new world coming into view. A world where there is a very real prospect of a NEW WORLD ORDER.” - U.S. President and Luciferian Freemason George H.W. Bush (41), Sept. 11, 1991. .“..when really a NEW WORLD ORDER can be created. It's a great opportunity. It isn't just a crisis.” - Jewish Elder and Bohemian Grove attendee, Fmr. U.S. Secretary of State Henry Kissinger. “The illegal we do immediately. The unconstitutional takes a little longer." - Jewish Elder and Bohemian Grove attendee, Fmr. U.S. Secretary of State Henry Kissinger. The Cold War “Victory” over Communist U.S.S.R. was staged by Judeo-Freemasonry. 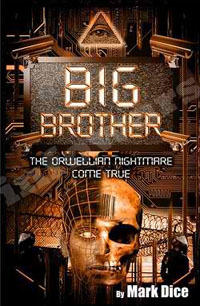 Anti-pope John Paul II, Ronald Reagan & Mikhail Gorbachev were all in the brotherhood. It was a nice story, but it deceived many Catholics into believing John Paul II was a miracle worker in the 1980's for “winning the Cold War without firing a shot.” Unfortunately, now we are able to prove this was set up to give power to the beast. “In October 1917 , we parted with the old world, rejecting it once and for all. We are moving toward a new world, the world of Communism. We shall never turn off that road!” He further reassures his Communist colleagues: “Comrades, do not be concerned about all that you hear about glasnost and perestroika and democracy in the coming years. These are primarily for outward consumption. There will be no significant internal change within the Soviet Union other than for cosmetic purposes. Our purpose is to disarm the Americans and let them fall asleep.” - Mikhail Gorbachev Nov. 2, 1987 address to the Soviet Politburo. 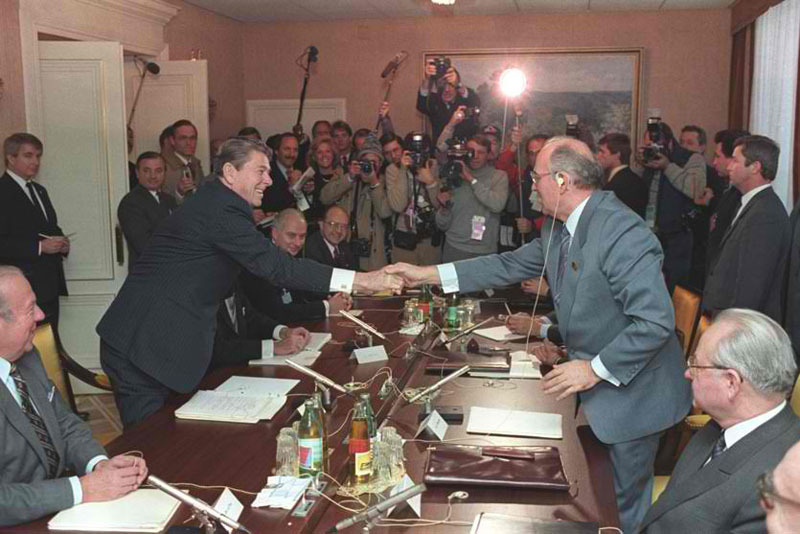 Bohemian Grove attendee and Moloch Worshipper Ronald Reagan (40th U.S. President) and Soviet Premier Mikhail Gorgachev in a famous “Cold War” Era Freemasonic Handshake. Click for link to our coverage about the Mark on the Right Hand: The Masonic Handshake. 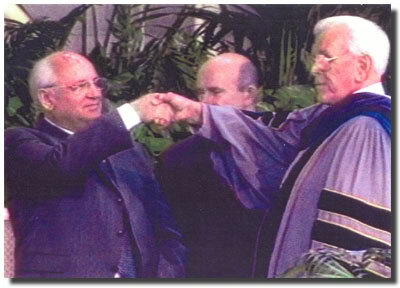 Jewish Freemason Mikhail Gorbachev displays the “Mark on the Right Hand” with American Protestant Freemasonic Spiritual Leader Robert Schuller. “Another reason why the environment is such an important issue to Gorbachev is that it will enable him to introduce and ratify comprehensive international treaties granting unprecedented power to seize government and private property all in the name of protecting the environment. In fact, Gorbachev's mandate for the future includes the imposition of stringent global environmental laws which would regulate every area of life. Toward this end he has been supporting the creation of an all-encompassing planetary document called The Earth Charter.” - Gary Kah The Environmental Agenda. ”The distribution of birth control devices and the imposition of mandatory abortion practices in the third world countries is now ecologically insufficient and unfairly out of world social balance. The white, upper and middle class females of modern society are too healthy and fertile to be exempted from some imposed regulation of international law or mandate. An American born child is environmentally too expensive to maintain to his or her adulthood in a world economy. American women must be subjected to some manner of regulation beyond licensing or immediate and mandatory abortion practices. Unconventional and extreme measures must be implemented and enforced by global U.N. mandate as it is deemed necessary. The bodies of these world eco-criminals should be commercially yielded for reintroduction in the world's natural systemic food and nutrient chains, in order to restore a more natural biological balance and order to our Sacred Earth.” - Jacques Cousteau, in his address to the Earth Summit in Rio de Janeiro, 1992. 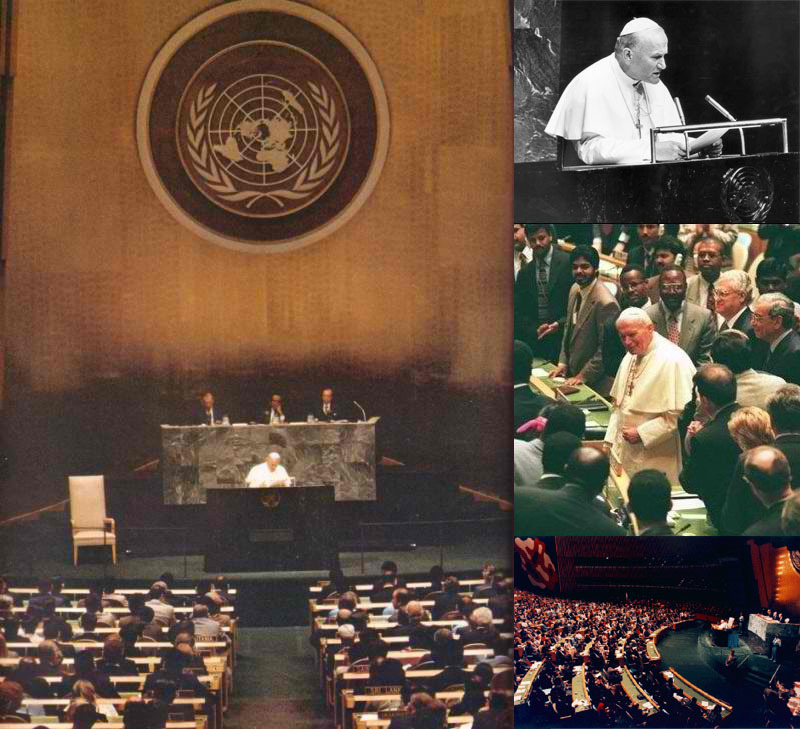 Jewish Freemason Anti-pope John Paul II spoke many times before the U.N., the governing body of the Masonic New World Order. He was always well received. “We operate here under directives from the White House.. [to] use our grant making power to alter life in the US. so that we can comfortably be merged with the Soviet Union.” - Rowan Gaither, former president of the Ford Foundation, in a 1954 statement to Norman Dodd regarding Congressional investigations of the un-American activities of tax-exempt foundations operating in the U.S.
“America is like a healthy body and its resistance is threefold: its patriotism, its morality and its spiritual life. If we can undermine these three areas, America will collapse from within.” - Freemason Illuminati Joseph Stalin (left), former dictator of the Soviet Union. “The First and Second World Wars were wars designed to kill millions were not successful enough hence the new methods outlined in the Global 2000 Report...The world is populated with too many redundant people who must not be allowed to procreate and consume scarce natural resources...The Committee of 300 (Illuminati) commissioned Cyrus Vance to write a paper on this subject of how to bring about such genocide. The paper was produced under the title 'Global 2000 Report' and was accepted and approved for action by former President James Earl Carter, and Edwin Muskie, then Secretary of States, for and on behalf of the US Government.” - Dr. John Coleman, former intelligence agent of British MI6, from his report, Global 2000: A Blueprint For Global Genocide, written in 1992 concerning the depopulation agenda of the Club of Rome. There is an avalanche of evidence available on the internet. This is just a small sampling of how deep the rabbit hole goes. Our concentration is centered around Our Lady's Message of Fatima, the knowledge given to us by the Mother of God to help us overcome this beast.